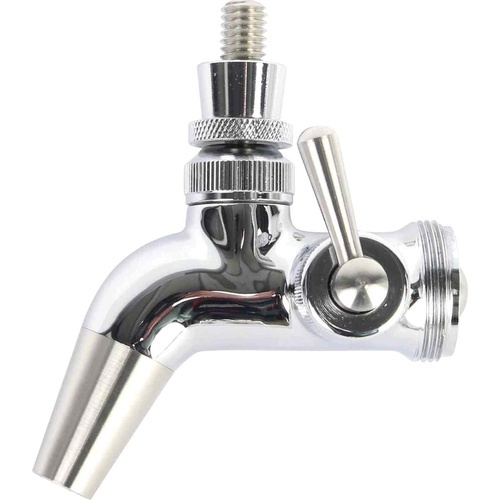 Made of 304 stainless steel and comes with a lever to control the flow of your beer. For my sons birthday, he picked it. Forward seal, stainless, and can control flow. Winner all around. This is for a friend. I already own one. More affordable, better reviews, and has option for stout faucet. Love it. A fellow homebrewer told me about it and the reviews were good. Cheaper than Perlick and design sounded a little more sound. Modular spout is cool! honestly, you were out of the regular ones. I already own one and I really like the ability to control the flow. Also, I love being able to change out the faucets so easily. Good reviews, costs less than perlick. I've read lots of good things and own a Perlick with flow control. Flow control is a must in my opinion! Beer comes out much nicer on the pour. I have been researching beer faucets for some time now. I was going to purchase some Perlick faucets because they had the flow control option. Then I saw the Intertap models which also have the flow control as well as the other options. I've read the reviews and saw no complaints. More options then the Perlick faucets and few few dollars less, I'm looking forward to getting the keg fridge finished. I'm building a kegerator and wanted control over each pour. This got good reviews so I figured I would give it a try. All ready have four needed to add one more. they work great! Decided to go with Intertap vs the competitor due to sulfur smell when using StarSan to clean or low pH beers with the competitor taps. Hoping that Intertap uses 100% SS to prevent this issue. Are there any locks that work with the flow control faucets? BEST ANSWER: At this time we do not offer a lock that will fit this design. Flow control is essential. Don’t hesitate to get this over a regular tap. It means the difference between foam and a good pour most of the time. Fine Faucets - probably but another to replace the other that i have. They are fine faucets, well desinged, flow control works as expected. i havent used the interchangeble tip, but definilitely, im gonna buy the Balllock and the Stout ones. They dont drip much, which is good. I replaced my Perlick flow control faucets with Intertap flow control faucets. I am extremely pleased with the Intertap facucets. Just threading them on the tower was smooth and the flow control valve works much better than the Perlick valve. I also like the interchangeability of the faucet tips. I admittedly haven't had these very long, but I'm really enjoying the flow control feature. This lets me just install lines long enough to reach from the kegs to the faucet shanks and not worry about having different lengths to balance the system. I haven't truly pushed the limits, but I intend to soon, with a Brut IPA at ~4 volumes. Good looking hardware but having problems. I just built my keeper. For 3.5 years I have been kegging and pouring from a picnic faucet with no major pouring problems. Since hooking up the intertap flow control faucet I can't make a good pour. My glass is 3/4 foam no matter how I change the flow. I will keep tinkering with it, but it would have been nice if it came with helpful hints. I believe I should have passivized the ss faucet and shank too because my beer now tastes metallic when a week ago it tasted fine coming out of the picnic faucet. I hope I can figure out these problems because I have 1 more to install. Feel free to respond with advice. Hi Scott - It is always a safe bet to clean and sanitize any new equipment before use. In regards to the foam, the flow control faucets obviously have more components, and thus more things for beer to move around, causing turbulence. Make sure there is plenty of beer line before the faucet, start with it fully open, if it pours too quickly, the beer may be over carbed, or pushing too fast. 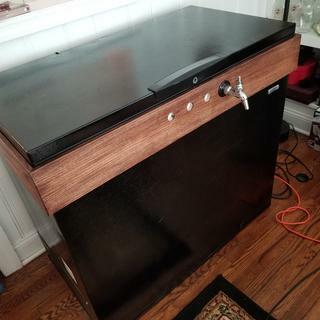 Good lookin Keezer. I have a keezer, and my beer fridge/fermentation chamber is next to it so the tower on my keezer (dual tap) always hits the side of the fridge. With the Intertap, it doesn't leak. Similar to Perlick but with adjustable end. Well made. Have had no issues with it. I don't like picnic taps. I wanted a setup that could directly connect to the beer QD, eliminating the need for tubing. 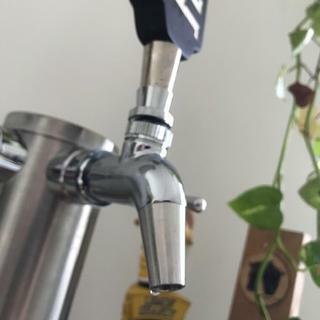 I used a corny keg disconnect faucet adapter to connect the faucet to the beer QD (flare type not barb) and done! I will say that it would get 5 star but connecting to the adapter to the faucet can be a little wonky...too tight and the flow control won't work...but play around and you'll get it...with no foaming issues!! I also love that there are different adapters that can attach to the faucet for CPBF (again, no foaming) or for directly filling growlers. Well made product. No sticky beer gumming up the works of the faucet. So far it doesn't stick. I like the flow control as well. Beautiful faucets, fantastic product; clean them first! Once receiving and cleaning the machine oil from my Intertap flow controls from MoreBeer!, I set about attaching them to my beverage out ball lock QDs. With the addition of another o-ring to the rear of the faucet, I was able to use them with full range. You should always clean new items, but mine had quite a bit of machine oil and the associated smell (not a bad thing, but not a beer thing) inside the tap. The outside was wiped clean. I disassembled, washed with liquid soap and bottle brushed them and let dry. Once mounted, they are easy to adjust to the right amount of flow. I have my kegs set at 12 PSI, and the taps let my beers be their best with little fuss. Worth the already good price - MoreBeer! has these for ~$15 less than elsewhere. There are quite a few o-rings inside the taps, so I would recommend getting at least one Intertap o-ring kit (D1215A) "just in case." These are a fantastic product. Good control of flow, like the exchangeable tip. I have Perlick flow control also and prefer the intertap. Better price, and performance than Perlick and I love the stout nozzle option. Ever since I got these flow control faucets and a canning machine it has brought a whole new level of fun to this hobby, no counter pressure filler or adjusting the co2 needed, simply turn the valve down and gently fill up the can, no foam! So fun! Bought this for him for his birthday. His review - Great engineering and fantastic product. Have tried two other faucets brands over the years and both needed regular washer replacement. Changing the washers was like performing surgery. Total pain. The Intertap Faucet has been problem-free and the Flow Control make filling growlers easy. Thank you. Easy to install. Works great. No issues with stocking so far. Overall I really like what this faucet provides at a reasonable price. I don't need to keep a cap on the end to prevent the handle from sticking like with my other faucet. I can put on the growler fill spout quick and easy. It just plain works well. The only thing I'm not sold on is the flow control actually doing anything but control the flow. No matter what the flow rate, I get the same amount of foam. I have my lines set up at proper lengths for the diameter, but I just can't seem to get the flow to do anything for me. But, like I said, I'm still glad I purchased two of these. Fantastic product! Would buy again for sure! I initially bought one, and it was lights out better than the cheap chrome one that came with my initial kegging kit. Since then I have bought 3 more. They seal well, drip very little, and don't get stuck when you don't use them for a while. The extra bonus is being able to switch out the end for a ball lock or growler filler, makes these very versatile. As good as my perlick faucets but cost less. These are great faucets, the adjustable flow allows me to mount directly on the keg without having foam issues. Installed these on our jockey box and thrilled with performance! Highly recommended. I love this faucet even more than the Perlick flow control faucet. Perlick faucets are good but Intertap has less dripping and a smoother pour. I just installed this faucet and it works great with a nice open and closing motion. Fit and finish is excellent! Works great to bottle beer with the Intertap Ball lock adapter and a Blichmann Beer Gun!